Inimitable wordsmith Aaron Sorkin makes his directorial debut with “Molly’s Game,” an overlong, if smart and entertaining, film about real-life “Poker Princess” Molly Bloom who made a fortune running high-stakes poker games for the wealthy, some of them celebrities. For fans of TV’s “The West Wing” and films like “A Few Good Men,” “The Social Network” and “Steve Jobs,” they will be in awe of the crackling, fast-talking dialogue that is Sorkin’s bread and butter. Hyper-articulate and intelligent in ways that could turn tiresome to some, Molly Bloom is very much a Sorkin character and a savvy, fierce player in a male-dominated world, and it’s a great fit for Jessica Chastain who plays Bloom and handles the dexterity of Sorkin’s speedy, quick-witted verbal gymnastics with aplomb. 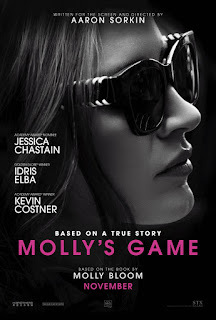 Based on the real Molly Bloom’s 2014 memoir, the film begins with Molly (Chastain) as an Olympic-level skier, ranked third in North America in women’s moguls, until an injury during the trials at Deer Valley forced her to change the direction of her career. (Previously, when she was 12, her back exploded when it turned out she had rapid onset scoliosis and needed a 7-hour surgical procedure to remaster her spine, but she was back to skiing in a year.) Despite the constant demands of her tough-love psychologist father, Larry (Kevin Costner), who would push his children to their limits, Molly postponed law school and moved to Los Angeles. There, she worked bottle-service jobs at nightclubs until landing a second job as an office assistant for club regular and investments partner “Dean Keith” (Jeremy Strong), who was a crude jerk but introduced her to the most exclusive high-stakes underground poker game. She would soon break away from “Dean” and run her own private games in a Plaza Hotel room in Manhattan and deal with movie stars to members of the Russian mob, and soon land a book deal, telling her story but keeping the names confidential. Now facing criminal charges, her only ally happens to be her honest criminal defense lawyer, Charlie Jaffey (Idris Elba), who begins to realize there is more to Molly than spearheading an illegal gambling operation. 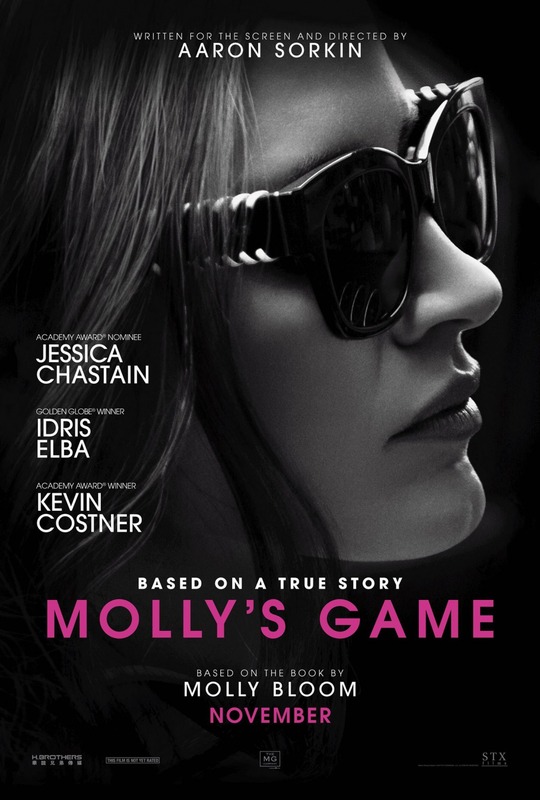 Before being framed as a narrated flashback structure, “Molly’s Game” is rooted in the present, twelve years later after her skiing accident, when she was arrested in the wee hours of the morning by seventeen FBI agents in her West Hollywood apartment, even after she hadn’t run a gambling operation in two years. Scenes that go back even further than the time she built her empire shows traces of Molly’s independence and rebellious streak when she was a teenager (played by Samantha Isler). With poker driving the story—and even if one barely knows the game, the scenes at the table are exciting to watch—the real core is Molly Bloom’s strength. How she made her way to become known as the “Poker Princess,” Molly was a quick study, organizing the weekly games, collecting the players’ buy-in money and sitting in on their games, learning poker by looking up her key words on her laptop, while also keeping track of winnings with her spreadsheets. 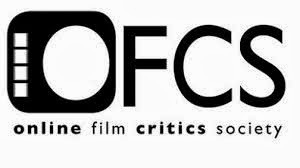 The film also doesn’t let Molly off the hook, particularly before her arrest as she is confronted by the Russian mob and given a painful message within an inch of her life. This is, first and foremost, Jessica Chastain’s film, and everyone else is just co-starring in it. She can’t help but form a fascinating, direct and complicated person as Molly Bloom. Idris Elba at least gets to be on her level, challenging her and then supporting her as Charlie Jaffey, while Michael Cera is another standout making an against-type turn as one of Molly’s clients (who may or may not be based on Tobey Maguire) after turning his socially awkward on-screen persona on its head in “This Is the End.” Other players who are mere pawns in Molly’s scheme are played by Bill Camp, Chris O’Dowd, Brian d’Arcy James, and Joe Keery (Netflix’s “Stranger Things”). The daddy’s issues of Molly’s story only feel wedged-in with a false, contrived scene on an ice rink in New York when Molly finds herself at her lowest point, but luckily, Chastain and Kevin Costner make the scene more effective and cathartic than it has any right to be. 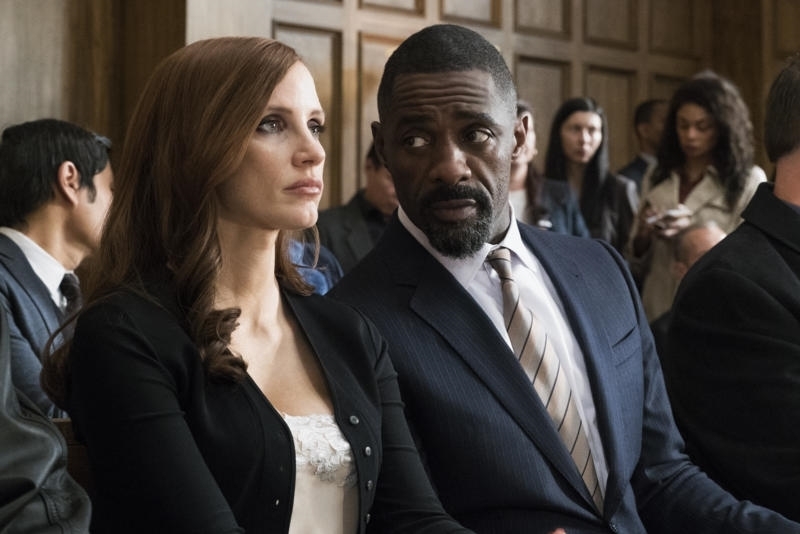 Overall, “Molly’s Game” is an auspicious first hand behind the camera for Aaron Sorkin, but it’s his central performance and expertly written repartee that keeps the viewer rapt and the pacing snappier than a 140-minute running time would suggest.